Assigned status Up to Date on April 11, 2016. Pharmacologic dilation of the pupil is one of the myriad explanations for unilateral or bilateral pupillary dilation. It is typically characterized by poor or no pupillary constriction to light or near stimuli. Clinical differentiation from similar appearing life-threatening pathologies, most notably compressive lesions of cranial nerve III, is vital. Most commonly, the medications, drugs, and toxins that cause pupillary dilation act via iris parasympathetic receptor blockade (anticholinergic mydriasis) but sympathetic stimulation (e.g., topical epinephrine) can also produce lesser degrees of pharmacologic mydriasis (without impairing the light/near reaction). Agents that affect the central nervous system such as atropine, scopolamine, amphetamine, marijuana, lysergic acid diethylaminde (LSD), and glutethimide can cause bilateral mydriasis. This effect is usually accompanied by other signs of central nervous system involvement, such as depression, agitation, and altered level of consciousness. In contrast, the unilateral dilated pupil is usually due to local or topical exposure to an assortment of dilating agents (e.g., mydriatic drops). Anticholinergic mydriasis, also known as pharmacologic blockade and “atropinic” mydriasis, refers to the absolute or partial paralysis of pupillary constriction unilaterally or bilaterally due to topical advertent or inadvertent exposure to an anticholinergic agent. Topical exposure to environmental toxins such as Jimson weed (Datura stramonium) or bella donna alkaloids can also produce mydriasis. Several household or garden plants found in North America contain high concentrations of alkaloids including atropine, scopolamine, hyoscine, and hyoscyamine. The route of exposure to these plant-based mydriatics can include aerosolization of particles from the plant, or direct finger-to-eye contact (e.g., a farmer working in a dusty field, a gardener, or a child picking flowers). Accidental application of nasal drops or sprays with adrenergic properties may also cause a sustained dilation of the pupil (with relatively preserved light reaction). This is also the mechanism of mydriasis caused by indirect acting sympathomimetic drugs like cocaine and amphetamines. Cocaine blocks norepinephrine reuptake at the junction and amphetamines stimulate release of norepinephrine at the junction leading to iris dilator muscle contraction. Adrenergic mydriasis can be distinguished from anticholinergic mydriasis or a cranial nerve III lesion by the presence of blanched conjunctiva, lack of ptosis and motility deficit, and residual light reaction. Local injection of botulinum toxin to treat various neurologic conditions or accidental systemic exposure can also cause toxic pupil. In almost 50% of cases of systemic botulism, bilateral dilated pupils are seen. The mechanism is presynaptic inhibition of acetylcholine release from the short ciliary nerves innervating the iris sphincter muscles. The primary risk factor is exposure to causative agents. Common examples of accidental exposure include finger-to-eye contact after handling an anticholinergic agent (e.g., healthcare workers, travelers with motion sickness) and ill-fitting nebulizer treatment masks. Anticholinergic mydriasis occurs via blockade of parasympathetic muscarinic acetylcholine receptors on the iris sphincter muscle. Adrenergic mydriasis occurs by overstimulation of the α1-receptors of the iris dilator muscle leading to sustained contraction. Local botulinum toxin overexposure or systemic poisoning leading to mydriasis occurs via presynaptic inhibition of acetylcholine release from the short ciliary nerves innervating the iris sphincter muscles. Primary prevention is best accomplished by avoidance of exposure to causative agents. Healthcare workers can reduce their risk of this condition by employing proper hand hygiene practices. Often the diagnosis can be made based on a detailed history (e.g., use of topical mydriatics, nasal inhalers, scopolamine patch for motion sickness) supported by physical exam. Special attention should be paid to the patient’s recent exposure history to possible mydriatic agents. Characteristically, the pharmacologically blocked pupil will have the following qualities: poor or no response to light and poor or no response to near. There should not be ptosis or ocular motility restriction (as in third nerve palsy). There will be poor or no response to pharmacologic (pilocarpine 1%) testing because of the pharmacologic block. The condition may be unilateral or bilateral. Patients with bilateral pupil involvement from anticholinergic toxicity may present with altered mental status, dry skin, fever, flushing, myoclonus, seizures, and urinary retention. The patient may complain of photophobia and/or blurred vision, but it is not unusual for a patient to be asymptomatic. In the setting of systemic anticholinergic poisoning, the patient may have multiple systemic complaints such as heart palpitations, shortness of breath, constipation, urinary retention, tremulousness, memory difficulty, and visual hallucinations. The diagnosis is made based on the history and physical exam as described above. Pharmacologic testing of the dilated pupil with varying concentrations of pilocarpine eye drops can be useful in diagnosis. The following protocol may be used: 1. Instill 1 drop 1/10% or 1/16% pilocarpine in each eye. Observe for 45 minutes. If parasympathetic denervation/tonic pupil (e.g., Adie's pupil) present, the involved eye with the dilated pupil will constrict. The mechanism is hypersensitivity of the cholinergic receptors of the iris sphincter muscle. 2. If no constriction following dilute pilocarpine administration, instill 1 drop 1% pilocarpine in each eye. If compressive lesion of cranial nerve III present, constriction of the dilated pupil will occur because there is no dysfunction of the muscarinic receptors of the iris sphincter muscle. If constriction occurs, then consideration for evaluation for third nerve palsy (e.g., exclusion of posterior communicating artery aneurysm should be pursued via high resolution cranial CTA and MRI/ MRA imaging). 3. If following concentrated topical 1% pilocarpine drop administration, no constriction occurs and there is no reaction to light or near, the diagnosis of pharmacologic pupil can be made. Note: One exception is botulinum toxin poisoning. The presynaptic inhibition of acetylcholine release by the neurotoxin results in a toxic dilated pupil that does constrict following 1% pilocarpine administration. The causes of anisocoria include the following: physiologic anisocoria, cranial nerve III lesions (both compressive and vasculitic), parasympathetic denervation with tonic pupil (Adie's pupil), cavernous sinus pupil, midbrain lesions, “tadpole” pupil, trauma, congenital mydriasis, alternating contraction anisocoria, Horner syndrome, episodic unilateral mydriasis, Argyll Robertson pupils, local iris disease (e.g., sphincter atrophy, posterior synechiae), angle closure glaucoma, and iatrogenic mydriasis secondary to ocular surgery especially penetrating keratoplasty for treatment of keratoconus (Urrets-Zavalia Syndrome). Once the diagnosis of anticholinergic or adrenergic mydriasis is made, the patient can be reassured that the pupil will return to normal size and vision (accommodation) as the effects of the precipitating agent diminish. Steps should be made to prevent repeat exposure to the precipitating agent. The patient should be seen in routine follow-up after discontinuation of the precipitating agent (exact timing will depend on the half-life of the agent and route of administration), to ensure return to baseline. Persistent pupil dilation after a sufficient wash-out period should prompt re-evaluation for other causes of pupil dilation. Prognosis is excellent for pharmacologic dilation of the pupil, and the condition should completely resolve with removal of the precipitating agent. Resolution of dilation depends on the different agents' half life. American Academy of Ophthalmology. Pharmacologic mydriasis Practicing Ophthalmologists Learning System, 2017 - 2019 San Francisco: American Academy of Ophthalmology, 2017. Schiffman JS, Tang RA, Pass AF, Hayman LA. Pupil dilation. In: Ettinger AB, Weisbrot DM, ed. Neurologic Differential Diagnosis A Case-Based Approach. Cambridge, United Kingdom: Cambridge University Press; 2014. Moeller JJ, Maxner CE. The dilated pupil: an update. Current Neurology and Neuroscience Reports. 2007; 7:417-422. Bartlett JD. Abnormalities of the pupil. In: Bartlett JD, Jaanus SD, ed. 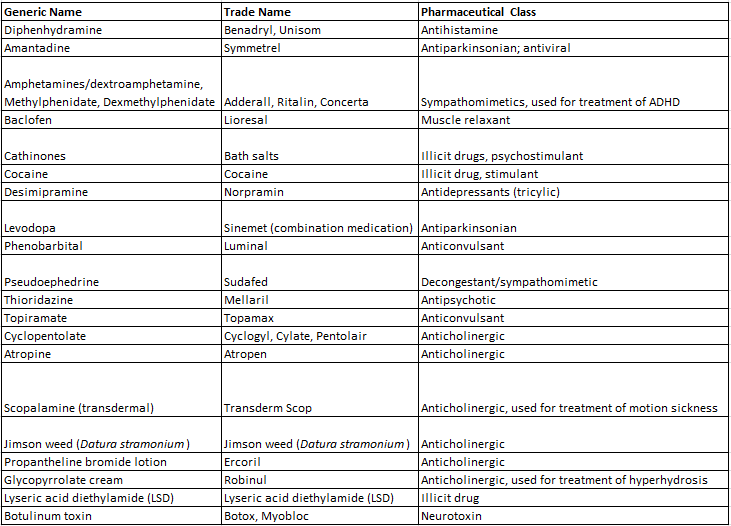 Clinical Ocular Pharmacology. Stoneham, MA: Butterworth-Heinemann; 1989: 431-454. Slattery A, Liebelt E, Gaines LA. Common ocular effects reported to a poison control center after systemic absorption of drugs in therapeutic and toxic doses. Curr Opin Ophthalmol. 2014;25(6):519-523. Stead, LG; Stead, SM; Kaufman, MS (2006). First Aid for the Emergency Medicine Clerkship (2nd ed.). McGraw-Hill. pp. 395–6. ISBN 0-07-144873-X. This page was last modified on February 22, 2019, at 10:28. This page has been accessed 47,375 times.